What happens when a kid growing up in late 80s California gets a call from the Queen of England asking for help? He becomes Mac B. Kid Spy! Mac is tasked with retrieving an interesting item stolen from the Crown Jewels. The Queen believes that the President of France has taken it, but Mac discovers the truth is much more complicated. He travels through Europe in order to find the Queen's missing item as well as some other items that have disappeared along the way. This was a fun book and I loved the humor throughout it. As a kid who grew up in the 80s, I loved the references to the disappointing graphics of the Game Boy and comments like "Phones had cords. You can look that up." Those bits might lead to some fun conversations between parents and kids as they read. 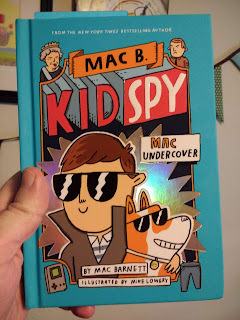 Mac's situations throughout the book definitely led to a few laughs, and I hope I'm not the only reader to suspect that he has a karate battle with a future world leader. Although it was fun to read, it was a very simple book. The plot was straightforward and the vocabulary was basic. I think this would be a great choice for kids who are just entering the world of chapter books. More advanced readers may have a good time with this book, but it is not one that will give them a lot to think about. That being said, I gave this to my son as soon as I finished it. He was over halfway through less than a half hour after picking it up and I heard him laugh out loud as he read. It's not one that I will be recommending to the grade 3-5 students in my advanced learning program, but I do think it's one that many will enjoy finding in our school's library!